Tags are a great to way to keep track of all the different projects that are happening in your company. With so much going on, it can be easy to lose track of things, and tags will help you find the projects you need quickly and easily so you can get to work! 1. When you create a project, the first thing to do is add all your details into a task card (unless you use our pre-baked Smart Projects where we do all of this for you! ), including tags. 2. Let’s say you’re working on multiple ad campaigns, and you’ve added the tag, "Advertising" to your task cards. 3. 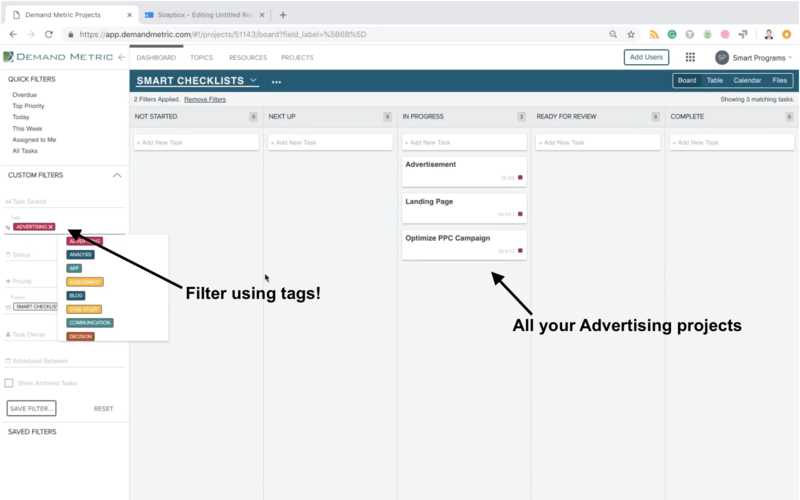 If you need to pull up all your ad campaign projects quickly, go into filters, and select filter by Tags. 4. 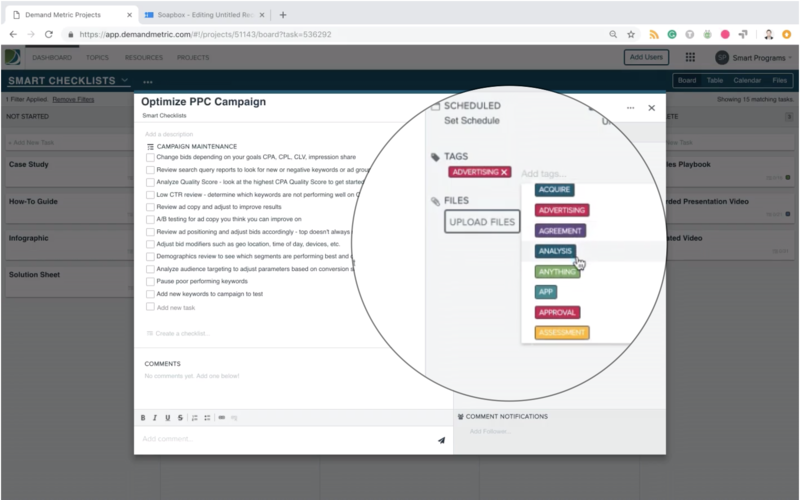 Simply enter "Advertising" under the tag filter, and you’ll quickly see all your ad campaigns come up in your Board View, Table View or Calendar View. 5. Use them wisely! By this we mean, avoid the urge to over-tag. Use one or two tags, and keep them simple and focused, otherwise you may have the same tag pulling up completely different types of projects. In addition to the power of the Demand Metric app, you also have access to over 1000 tools, templates, how-to-guides and other resources!